oceans. We debated long and hard on this issue. We would love to have him with us, but in the end, we did not feel that is was either fair to him, or a practical decision for us. 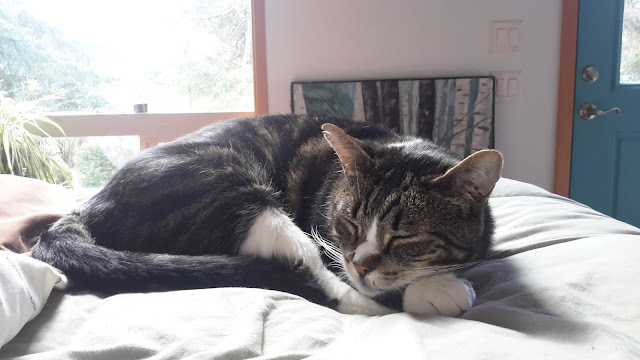 Some of the factors that led to this decision were fear of losing him off the boat, dealing with the kitty litter, Customs and Immigration in various countries and one of the biggest- what do we do with him while we are traveling off the boat? When we travel from home (our former home?) we could ask friends to stop by and feed him and check up on him. This is more difficult when the home is a boat. Will the boat be in the water? on the hard? How long would we be traveling? Ultimately we decided that the best thing for Ziggy would be to find him a new home. This brings up a whole new set of issues. Who will take him? Will they be the right fit? Will they love him as we do? We feel very fortunate to have found someone to take him into their home. Thank you Patti and Howard, we are extremely grateful to you for adding this creature to your lives. We know that he will be happy with you, and we hope that he can bring joy to your lives. Ziggy, we will miss you.